This unadorned interior view of a Cliff May Rancho reveals the richness of original materials, including birch paneling and cabinetry in the living room and kitchen, exposed-beam ceilings, and translucent glass panels. Cliff May's homes were certainly inspired by the Western ranch house, but they are unique in their modern interpretation of this California design. The Long Beach Cliff May's were built in the early 1950s and reflect the modernist influences of the time with open floor plans, exposed post-and-beam ceilings, clerestory windows and floor to ceiling glass. Cliff May, Chris Choate and Ross Cortese teamed up to design and build the Californian, the style of home that is most commonly referred to as the Rancho. Click here to download the original sales brochure from the 1950's. Many Cliff May designs are L- or U-shaped and are positioned to the back of their lots, a design layout which he envisioned would provide for more open outdoor space and an enhanced relationship between the homes' interior and yard. 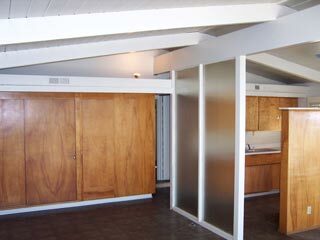 This placement, which was seen in many of Frank Lloyd Wright's Usonian homes, is revolutionary, and to this day there are few communities like it. Moreover, because of the generous "set-back" rules within the Long Beach tract, owners are able to fence these areas to create compound-like environments for more private enjoyment of their garden or pool. Visit the new Cliff May Ranchos group on Yahoo! Looking for original Cliff May windows and doors? Have a vintage oven or cooktop? This is the place to find (or find a home for) your hardware, fixtures and building materials.